The flagship duo Galaxy S8 and S8 Plus from the Korean major Samsung are undoubtedly one of the most anticipated devices of 2017. The first ones to book the Galaxy 8(Plus) have already started to receive the same with free goodies. However, some of those were reporting of an ugly looking reddish tint on their S8’s infinity display. As the infinity display is the most highlighting semblance of the S8, it was eventually spoiling the user experience on such an adorable device. To fix the issue, Samsung has recently pushed an OTA update for the Korean and UK variants last week. Following the same, the US carrier T-Mobile is also rolling out a firmware update for the Galaxy S8 and S8 Plus devices. The firmware update comes as an OTA(Over-The-Air) update and you will only receive it if you are running the stock Android 7.0 Nougat on your device. The firmware number has been updated to G950USQU1AQDE for S8 and G955USQU1AQDE for S8 Plus respectively. Updating the firmware will supposedly fix the red tint issue on the duo. However, if it doesn’t, Samsung will be forced to replace the devices for the same users. The OTA weighs around 145.29MB and you can install it on your phone using the updater app. If you haven’t received the OTA yet, you can follow the steps given below. 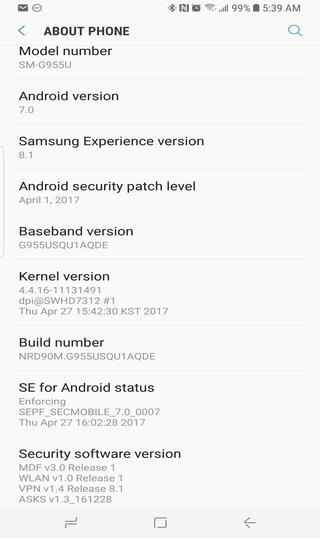 How to capture the OTA update on Samsung Galaxy S8(Plus) with G950USQU1AQDE/G955USQU1AQD9 build? As the update comes as OTA(Over-The-Air), devices running the stock Android 7.0 will only receive it. For those who haven’t, you can follow these quick steps. Go to the Settings on your S8 device. Following the above steps, you can capture the OTA on your device. Before downloading the update, make sure you are connected to a Wi-Fi network. Also, make sure your device is charged to at least 75% before installing the same. If you want to root your Galaxy S8 device head over to this tutorial. If you want to revert back to the stock Android on S8 follow this tutorial.